I was very taken with the little Neat Iota floorstanding speakers when first I encountered them at the Bristol Show in February: they didn’t even have a name, but they proved quite a talking-point – not least due to their trick of seeming to cast a soundstage image up to eye-level, despite standing just 45cm tall. 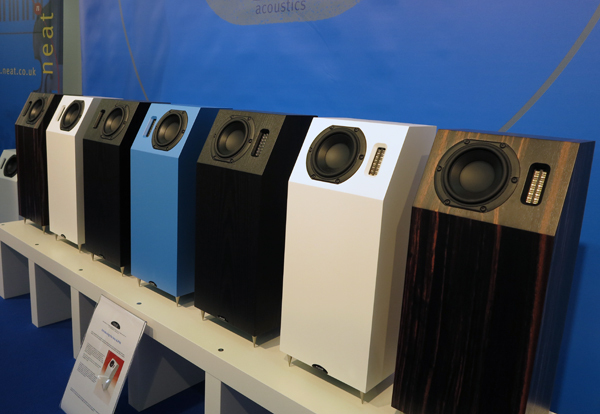 At the Munich Show in May, the speakers were again on display (above), in a choice of finishes, and they now had both a name – Iota Alpha – and a price: they’re £1385 a pair. True, they were on static display in Munich on an open booth, rather than in a demonstration room, but what I’d heard in Bristol was enough to convince me that I had to get a pair home for a listen PDQ. We now I have, and I’m here to report that, like the original Iotas I have on my desk, and which have performed solid service since they were launched, the Alphas perform way beyond expectations, and could be just about the most room-friendly speakers I’ve ever encountered. 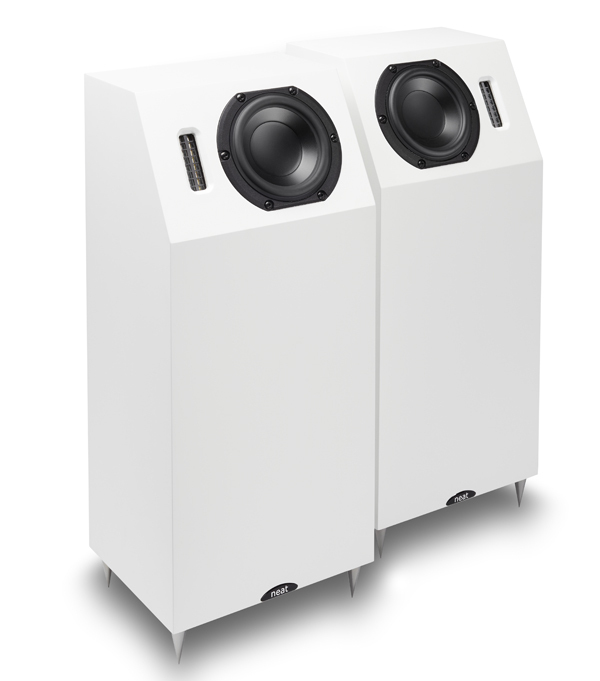 New readers start here: the Iota Alpha is about half as tall as most floorstanding speakers, and combines the drive units of the original – a 50mm EMIT planar magnetic tweeter and 10cm mid/bass unit – with an extra 13.4cm bass driver. The first two are in their own housing, which is essentially a sealed version of the Iota enclosure, angled upwards and attached to a ported chamber in which the downward-firing bass unit is mounted, the whole enterprise being mounted on four high-quality spikes. Placed in the room, and with a bit of breathing space behind them to let the port work, the Alphas immediately impress with the focus and precision of their soundstage and imaging. As the speakers are ‘handed’ – ie they come as a mirror-mage pair – you can use them with the tweeters inboard of the mid/bass units or outermost: after some experimentation I settled on ‘tweeters outward’. With them inwards there was definitely very sharp focus of elements in the soundstage, but my preferred set-up gave much the same imaging, and a broader, more natural soundstage with a greater sense of space and openness. But the real magic of these speakers is the way that image just hangs in the air before you, way above the top of the little enclosures. I had worried that I’d find myself having to look down at the speakers to hear them at their best, but there was none of that: instead I soon forgot I was listening to speakers well below my sightline, making them effectively visible in use. And they go low and punch hard, too: I tried them with a range of amplification connected to their single set of terminals, from an old NAD right the way through to a Naim Supernait2, and while the speakers were very good on the end of the less expensive amp, they really came to life when drive with a higher-quality amp with a dose of extra power. On the end of a Naim NAP 300 DR I happened to have passing through they sounded even bigger, richer and expressive, that deft, fast and well-extended bass underpinning a crisp, lucid midband and treble. 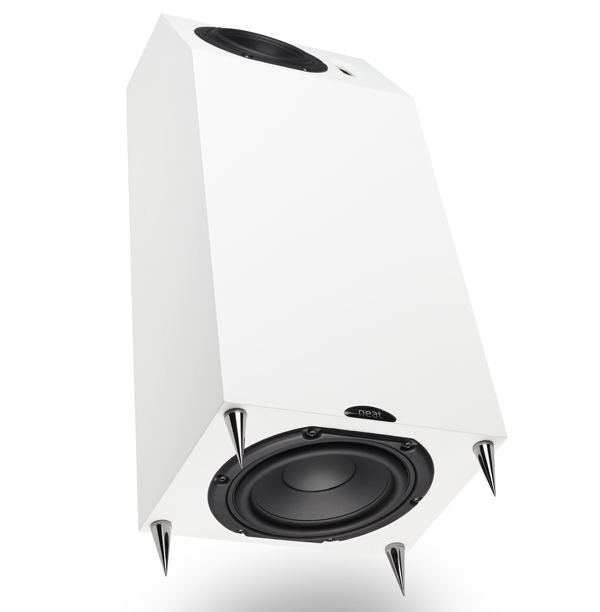 There’ll be a full review of the Iota Alphas in the August issue of Gramophone, on sale next month, but for now it’s enough to say that the speakers have to go away next week for measurement for another review, and they’re going to be missed. No, they’re not cheap, and the same money would buy you a pair of much larger, and considerably more impressive-looking, speakers – but if you want to introduce a dose of magic into your system, the Neat Iota Alpha really is a must-listen. Andrew, you don’t happen to have heard them up against the Motive SX2’s do you? I have the SX2’s and I wonder if the Alphas will have the same level of depth and bass response given that they are a lot smaller speaker. If anyone has heard these speakers side by side I would be very happy to hear from you. Afraid I haven’t, David. Anyone? Indeed! The Motive SX2 and Alpha comparison is a very interesting one that I look forward to making shortly. They are priced more or less the same, yet one is a relatively conventional in design and the other is anything but.